There’s some magic in the air, we’re just not sure where… Today, we’re looking at a bit of a puzzling title from Thunderkick. The Rift is a game that’s set in some creepy backstreets. The symbols used to depict prizes are represented by various magical looking items and a set of coins. The soundtrack is also kind of eerie. Since the slot lacks context or an opening sequence, we really can’t tell you much more than that in terms of what it’s all about! We can, however, talk about the mechanics of the title. It’s a five row, three reel game with a total of 17 win lines for players to match combinations of the same symbols down. The Rift features re-spins, free spins, sticky “wilds” and more. Let’s look more closely at the game. Great look and feel to the title. We’re not sure what Thunderkick were trying to achieve with their spooky visuals but the slot does score highly in the looks department. Several features. We like seeing games that offer a bit of diversity to their side games and The Rift delivers on this front. Highly confused theme. We guess that The Rift is about some sort of sorcery but without any context it all seems a little bit random. Low main game jackpots. 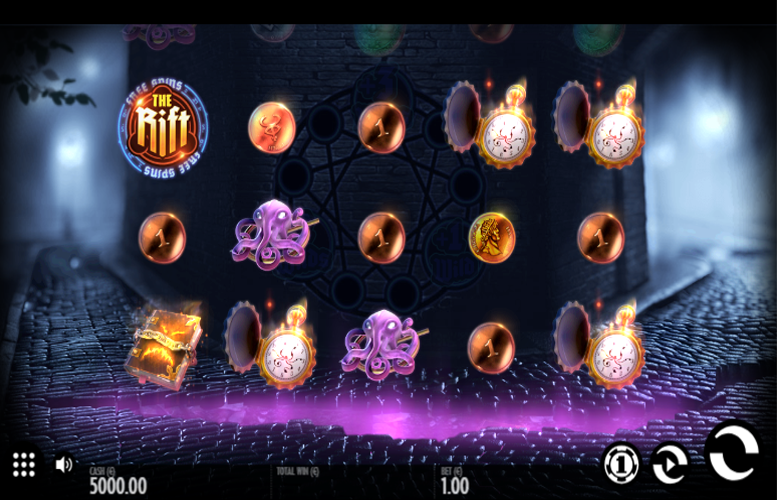 Unfortunately, The Rift suffers from a rather common issue in slots offering several features – the prizes for hitting big winning combinations are small! The top jackpots on The Rift slot machine are all awarded for matching five of the same symbols along a single win line. Unfortunately, we’ve absolutely no idea what the context to the action isso we don’t really know the significance of each illustration. That said, they do look pretty cool. Spell book = 30x the total bet. 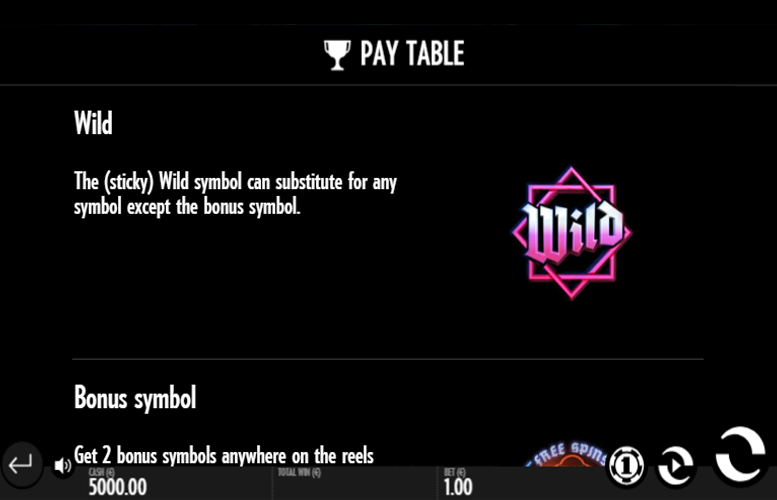 “Wild” symbol = 30x the total bet. Pocket watch = 17x the total bet. Purple sea monster = 12x the total bet. Emerald = 10x the total bet. 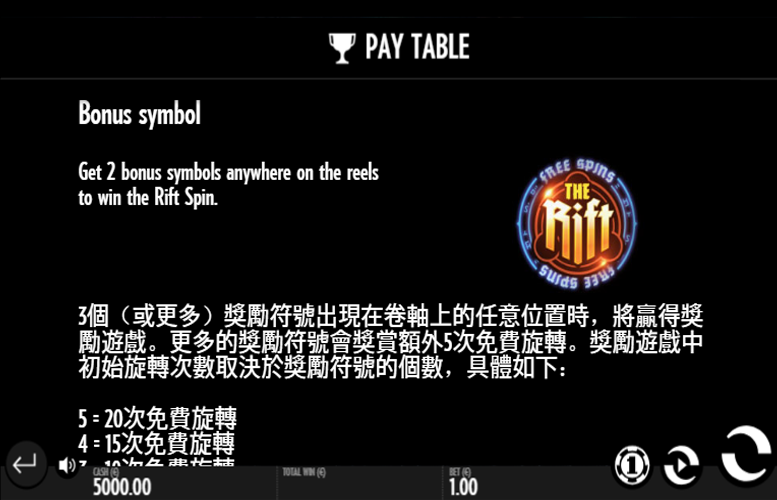 Landing two “Bonus” symbols anywhere on the reels will award the Rift Spin. When this is triggered, any “wild” not appearing on a winning pay line will become a sticky “wild”. In addition, an extra one to three sticky “wilds” will be placed randomly across the reels. 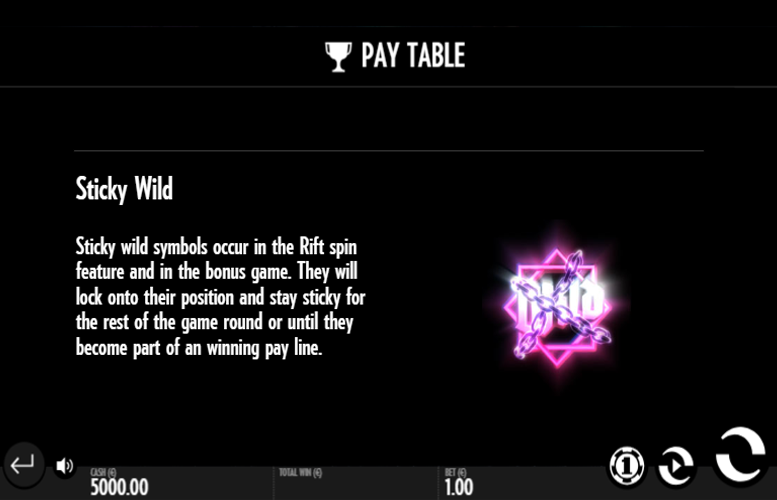 The pink sticky “wild” symbols occur during the Rift Spin and the Bonus Game. They will lock onto their position and stay stuck there for the duration of the game round or until they become part of a winning combination. 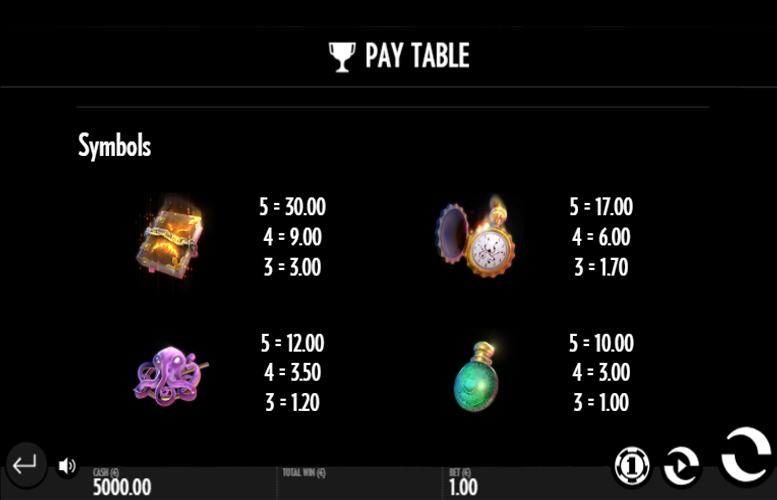 Four “Bonus” symbols = 15 Free spins. Five “Bonus” symbols = 20 Free spins. Each “Bonus” symbol that appears on the reels activates one step on the Rift Seal until it is completely filled. Every third step will grant two additional free spins and add one more sticky “wild” to every remaining spin of the Bonus Game. Gold coin= 6x the total bet. Silver coin = 5x the total bet. Bronze coin = 4x the total bet. Copper coin = 3x the total bet. Players are not given much scope to vary their bet distributions on The Rift. Rather than be presented with options to alter the number of win lines bet upon or how much they choose to wage on each, they are instead presented with 12 different total bet amounts. The figures range from just 10p to £100. Whilst certainly not the largest upper betting limits we’ve ever seen, they will likely satisfy all but the highest rollers around. The Rift is a decent enough slot machine. In fact, if its theme was a little clearer, we’d go as far to say it’s a good game. Not great. Just good. Things we liked about the title were the solid artwork through, the soundtrack, and the special features. Unfortunately, the lack of clarity on what the heck is actually going on stops us awarding a higher rating to this Thunderkick machine. That and the low main game prizes but it’s rare to find loads of features and high payments on the same game! This game has a rating of 4 / 5 with 419 total reviews by the users.